Quiver trees in the Quiver Tree Forest near Keetmanshoop, Namibia. We road tripped through Namibia for the month of March and can say, without question, that Namibia is one of the best countries we’ve been to. It’s unbelievably big, it’s unbelievably beautiful, and it’s unbelievably empty. (How is this place real!?). 1. The Nature There is LIT! This picture was taken in Sosussvlei National Park. To try to put to words what is really Nature with a capital ‘N’ is hard, but here are a few keywords that come to mind: pristine, striking, magnificent, and desolate. The landscapes can be straight out of a Star Trek episode and vary so much. 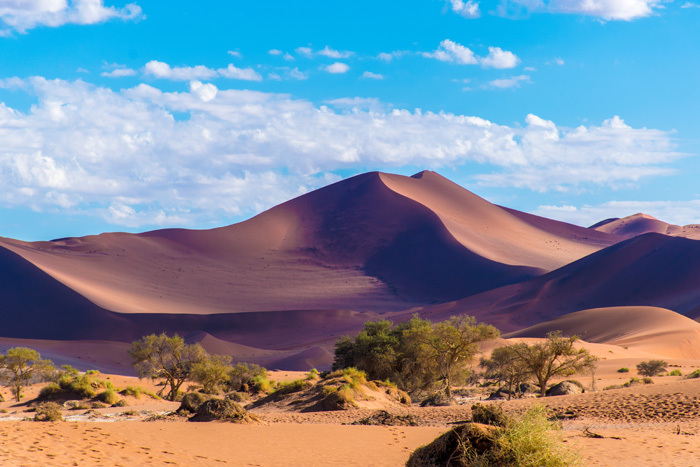 Sossusvlei is one of the most fascinating locations on the planet with magnificent sand dunes you can climb at sunrise. 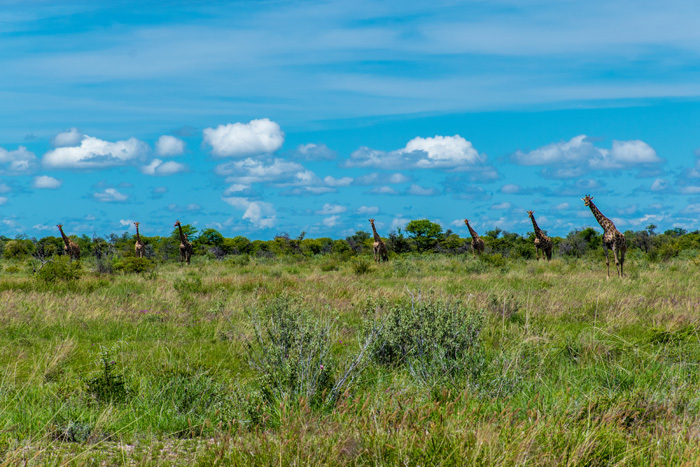 Etosha National Park offers a safari experience that will give you moments of pure wonder as you stare at elephants, giraffes, zebras and so many more animals just, well, being animals. 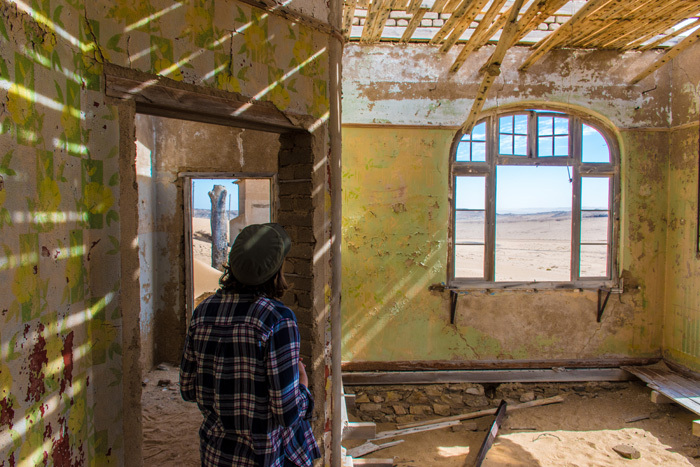 Don’t forget Kolmanskop: a friggin’ ghost town in the middle of the desert being reclaimed by sand and you get to climb into the abandoned buildings and poke around! Or maybe you get a chance to check out the Skeleton Coast where you can get up close and personal with some serious shipwrecks and major colonies of seals. 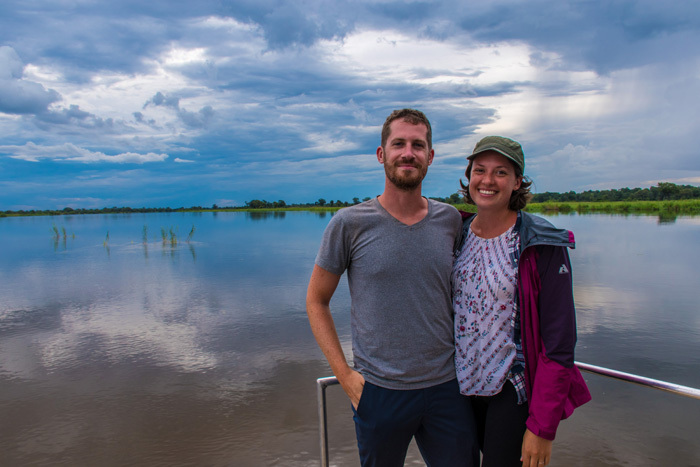 And, if rivers are your bag, you can make your way into Caprivi to tour the Cubango and Zambezi Rivers and spot hippos and crocs. 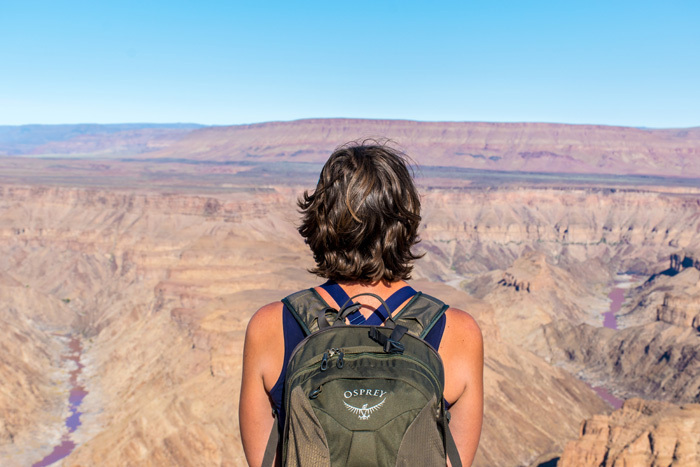 Oh, and let’s not forget to take a detour and see the largest canyon in Africa at Fish River Canyon (2nd largest in the world!). Wandering around Kolmanskop’s abandoned buildings. 2. Namibia is Not Trending (yet). Most people don’t even know Namibia exists, therefore there are very few tourists. You are one in a million (seriously: about 1.5 million tourists go a year). The population density of Namibia makes it one of the top 10 emptiest countries in the world, so even locals are hard to find. It’s seriously, mind-numbingly empty. If you want a chance to get off the beaten path and be alone to, I dunno, watch incredible stars: this is the place for you. Driving here can mean you won’t see another car, house or gas station for hours. It’s you, landscape, and maybe a zebra. 3. There are so Many Activities You Can Do! Like quad biking? Namibia’s got you. Want to float in a hot air balloon over colorful sand dunes at sunset? Look no further. Oh! How about swim in a crocodile cage and sunbathe while watching hippos live their family dramas? Hell yes, you can do that in Namibia. Out hippo watching on the Zambezi River! There are so many things you can do and at so many price points that there will be an activity for everyone. I’m not even scratching the surface with stuff you can participate in. Namibia is not creepy or dangerous. The locals are friendly and helpful (they speak English, German and Afrikaans among other languages). The roads are, for the most part, pretty well maintained. Your biggest worry wouldn’t come from petty theft or robbery but flat tires, cracked windshields and/or running out of gas. 5. The Wildlife and the Plants. Although this country is largely desert, there is a shocking number of animal and bird species you can enjoy while here. Etosha is packed with game and it’s quite common to see herds of animals moving across the plains. In Caprivi, you can go birding, although don’t limit yourself there: over 700 bird species occur in Namibia. Wildlife is packed around the Cubango and Zambezi as elephants, giraffes and cheetahs will migrate south toward the Okavango Delta in the rainy season. 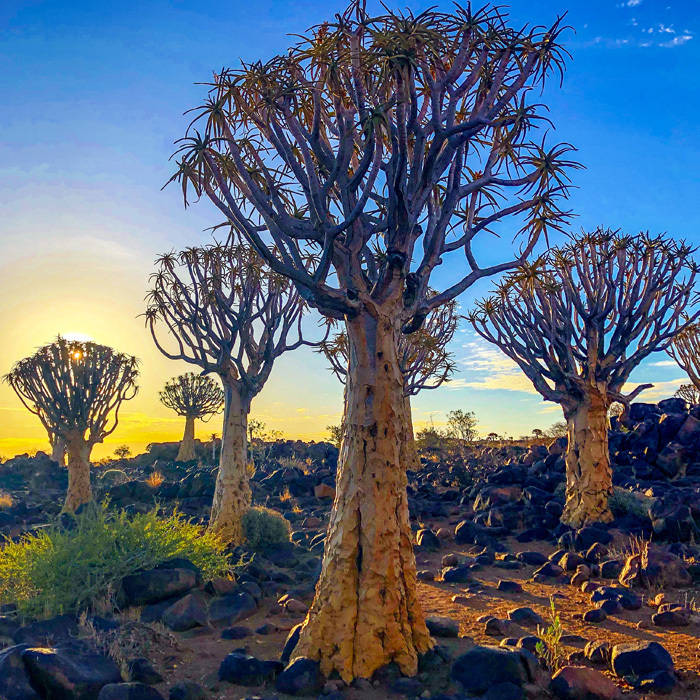 Oh, and if you are into really amazing can’t-find-this-anywhere-else plants: Namibia could tickle your fancy with quiver tree forests and 700-year-old dead trees that contrast mightily with their towering sand dune neighbors (honestly, a perfect place to snap some of the best photos in your life). Have I convinced you? I sure hope so. Have I mentioned this place is beautiful? Get yourself down there and see for yourself. You won’t be sorry. You had me right at the start with those fascinating Quiver trees. The landscapes, the animals, the ghost town and fewer tourists make Namibia sound so ideal. It all sounds so wonderful (except for the crocodile cage, that one is not for me). Your images are lovely, and yes, you have me convinced. You don’t need to convince me! I’ve really wanted to visit Namibia for a long time, and for these reasons you’ve listed. The landscape is incredible, and the nature just stunning. It’s great to know it’s a safe country to visit too. Can’t wait to see it for myself. Consider me convinced! Ghost town, shipwrecks, and seals. So many times people boast about off the beaten track destinations that aren’t actually accessible without breaking some serious laws. Do you have any tips for the best way to get there? Did you fly from NYC to Cape Town and make your way up from there? Hey Cori! I was on this trip with Natalie (the author of this post), and am the other half of A Pair of Travel Pants. We actually flew into Johannesburg from Singapore (we were in SE Asia for a wedding), and drove across South Africa to Cape Town, and then north into Namibia (starting at Fish River Canyon) from there! These are five reasons that are making me add Namibia to my list! I’m all about nature, and you’re not kidding, the nature here does look LIT! I also love that basically any activity possible is there – sounds like the perfect place to try something new. People also make the destinations a lot of times! I can’t wait to make my way there!